First of all….I didn’t realize that it was possible for candy to actually HAVE friends. 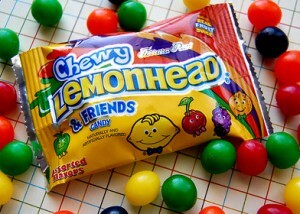 However, I learn something new every day, and thus…”Chewy Lemonheads & Friends”. Of course, many people looking at this box who would consider buying it might think back to their youth when they ate regular Lemonheads (or, if you’re like me, you’d only have to think back to yesterday. I LOVE the classic “heads” series, but more on that later) and to wonder what the differences might be. Regular Lemonheads have that thick, yet soft-ish outer shell that holds all the sour goodness. Inside is a firmer candy center that offers some crunch. Their new cousins of the chewy variety are a totally soft sour chew-no crunch. The good news is that the flavor and sour factor are excellent, and I gotta say, …they’re totally addictive. 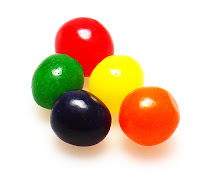 The flavors are the same as the classic kind- lemon, orange, cherry, apple, and grape. You can still find all of these flavors in the classic style, and in my humble opinion, are one of the best candy values around. But these new bad boys are really good too. At Candy Gurus, we don’t just try a candy and leave it at that. We realize that some candies “need” a little extra push in the right direction, usually in the realm of aging or cooling. The first time Matty and I ever explored the arena of candy cooling was over 15 years ago-with “Red Vines”. Those things fresh out of the box are a soft mess. No consistency at all. But take the lid off of a tub of them and let them sit out for a few months? Pure, aged, chewy goodness. Then there’s the cooling concept-many candies just aren’t firm enough, and a few hours in the fridge renders them almost a different beast altogether. Chewy Lemonheads & Friends don’t need much assistance to be good, but if you throw them in the fridge, they become stellar. They firm up a bit making them even chewier, and the flavor comes out just as well cold. The only place I’ve ever seen these for sale (besides online vendors) is at Cost Plus stores here in the Bay Area. And while I do love them, I can’t really eat JUST them. I like to have something a bit less tart and a handful of these as well. But that’s just me, folks. Try ’em and see what you think. Bottom Line:I say “hell yes” folks-this one’s a keeper for the sour fans out there.